Indonesia foils Komodo dragon smuggling gang. iCognative. 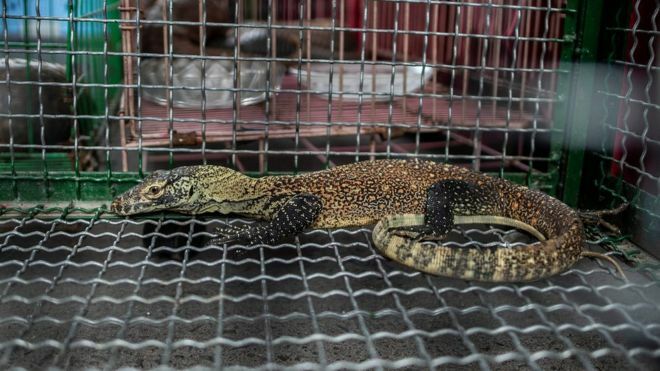 Five Komodo dragons and other endangered animals have been seized by the Police in Indonesia. These animals were being sold illegally on Facebook. The reptiles were being sold for up to $1,400 (£1,000) each, officials said. Five suspected smugglers had been arrested in Semarang and Surabaya. Komodo dragons are the world’s largest lizards. They can grow up to 3m (10ft) long and have razor-sharp teeth and a poisonous bite. The lizards, found on only a small group of Indonesian islands, are endangered in the wild and protected by international law, but are sometimes illegally smuggled as exotic pets. “The suspects sold the Komodo online through Facebook,” police spokesman Frans Barung Mangera said in a statement. The smugglers confessed to police that they had already sold more than 41 of the reptiles, said East Java police director Ahkmad Yusep Gunawan. Officials said they also recovered bearcats, cockatoos, and cassowary birds from the suspected smuggling ring. If convicted, the traffickers could face up to five years in prison and heavy fines. According to a 2012 report by the WWF, the illegal wildlife trade is worth $19 Billion a year. 350 million animal and wildlife specimens are trafficked every year. The WWF previously estimated that animal and wildlife trafficking to be worth between $15 billion and $25 billion a year. There are approximately 6,000 Komodo dragons left in existence and only about 350 breeding females. The numbers of Komodo Dragons have been reduced to a mere fraction of what they were – through habitat loss, loss of prey species, and hunting. Komodo dragons are being sold on the black market by wildlife traffickers. Trafficking of these animals is driven by worldwide demand for exotic pets. It is incredible that Komodo dragons are killed at such a massive scale. In order to protect Komodo Dragons and other endangered animals, the poachers, smugglers, and customers must be identified and prosecuted in a time-bound and cost-effective manner. This seems like a fantastical idea because existing investigative methods are not capable to defeat this sort of crime at a global level. There is a need for a method which can screen suspects in a quick yet reliable manner. The very scale of this crime warrants modern science to devise a technology which is efficient, reliable and non-invasive. There exists a way with which the entire supply chain, beginning with the hunters to the end customers, can be identified. A Massachusetts based company called Brainwave Science has introduced a way to interrogate suspects and witnesses in a non-invasive fashion. This technology, called iCognative can help to extract the most amount of information from the detained men. The results of an iCognative test is more than 99% accurate. On the other hand, a DNA or a fingerprinting test has limited applicability because related samples are only uncovered in only 1-2% of the cases. iCognative is an extremely useful technology because it is applicable in more than 85%-90% of all criminal and civil cases. iCognative is not limited to trafficking cases, but also equally applicable to human trafficking, drug trafficking, immigration, national security, border security, counter-terrorism, and law enforcement. To stop the poaching of Komodo Dragons, and to bring the poachers, smugglers and customers to the books, the enforcement agencies need to coordinate with each other.